2018 Long Term-Going Steady Atomic Sponsors! The season 14 application is alive and kicking! Just click the "2019 Application" tab on the Menu to the left and apply. The Sarasota Municipal Auditorium is located at 801 N. Tamiami Trail, Sarasota, FL 34236. Atomic's Main Room is entered through the front of the building from the parking lot and is a $5 Admission to enter for Adults and Teens, 12 & Under get in free. Atomic's Bay Front Room was added to offer outstanding Atomic talent that could not be squeezed into the Main room! The Bay Front Room is not accessible from the Main Auditorium but is only a short walk around the municipal building towards the SRQ Orchestra on Van Wezel Way. On a Budget? The Bay Front Room Free to Enter! Atomic's Street Fair is located between the Auditorium and the Art Center buildings on Plaza De Santo Domingo and is free for public consumption! Atomic's street fair is filled with colorful makers bringing their best delights for holiday shopping. 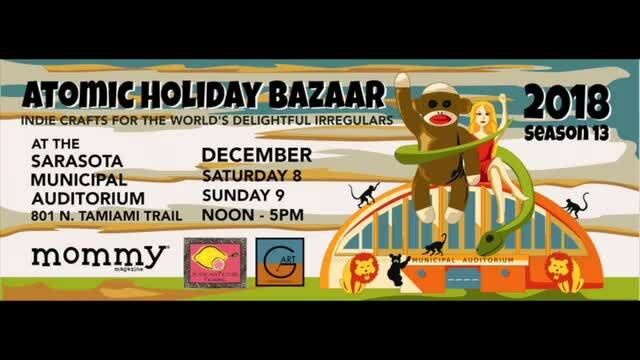 The antidote to the big-box, Black Friday-esque shopping culture during the holiday season has a name: Atomic Holiday Bazaar. The two-day extravaganza, with its crafts and arts for the world’s delightful irregulars is back, bigger and badder than before. Want to bolster the local small-business economy while hunting for the most eye-catching, conversation-starting items in Southwest Florida? Be one of the thousands of expected attendees at the Sarasota Municipal Auditorium from noon to 5 p.m. Saturday and Sunday.